WE HAVE JUST PURCHASED SEVERAL 1898 KRAG-JORGENSEN (30-40 KRAG) WHICH HAVE BEEN IN STORAGE FOR 100 PLUS YEARS IN A U.S. ARSENAL AND HAVE NEVER BEEN IN CIVILIAN HANDS AS WELL AS SEVERAL 1903 RIFLES SET UP FOR NATIONAL MATCH COMPETITION WHICH HAVE ALSO BEEN IN STORAGE AND NOT IN CIVILIAN HANDS, SO CHECK OUT THE SITE UNDER MILITARY RIFLES AND GIVE US A CALL. Again all of us at YankeeArtifacts appreciate all of your patronage, The Old Yankee! See shipping details on the Buying page. We have been out straight bringing in new items, and there are more arriving daily! Welcome to Yankee Artifacts, home of Phil, the Old Yankee. The Old Yankee is a long time resident of New England, still living in the small town he was born in. If you are looking for a specific item, you can search for it or email the Old Yankee. 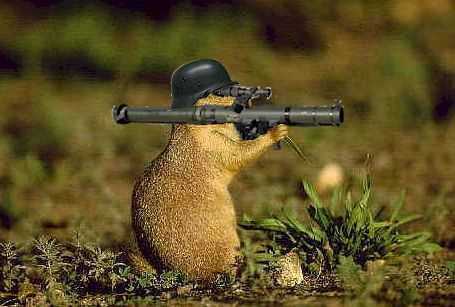 The wily woodchuck is an inoffensive yet challenging target. While normally harmless, the woodchuck can become dangerous when aroused. It is frequently hunted at ranges of 200-400 yards. Although many people believe that this is because they are shy and easily frightened, quickly disappearing into their burrows, experienced hunters know that the extended range is for personal safety. It is critical to move cautiously when encountering groups of woodchucks, as they are known to engage in cooperative behavior and react explosively.